The Hensall Heritage Hall was established in 1914 when the property was given to the village for the purpose of establishing a council chambers and town hall. Over the years the upper floor became the hub of the community and the site of musicals, theatre, dances, wedding receptions, recitals, visits with Santa Claus and much more. An ecumenical service was held at the Hall at the end of World War II to honour those who had served. Boasting such architectural features as a decorative tin ceiling, central circular floor grate and gallery, the Hensall Heritage Hall was, in its heyday, the grand dame of Main Street Hensall. After many years of use, the hall was closed in the 1970’s due to structural concerns. It is the hope of the Hensall Heritage Hall committee and its many supporters that following restoration the Hall will once again be a vital part of life in the community. Once restoration is completed the hall will feature such modern amenities as an elevator and comfortable portable seating that will allow for greater accessibility and multi-purpose usage. In front of the building a semi-circular bench featuring a life-size sculpture, by local artist/blacksmith Jim Wallace, will honour the village’s founding brothers James and George Petty and will offer patrons of the Hall a chance to take a seat beside Hensall history. The Hensall Heritage Hall top hat icon also pays tribute to the brothers as they appear in their famous photo. 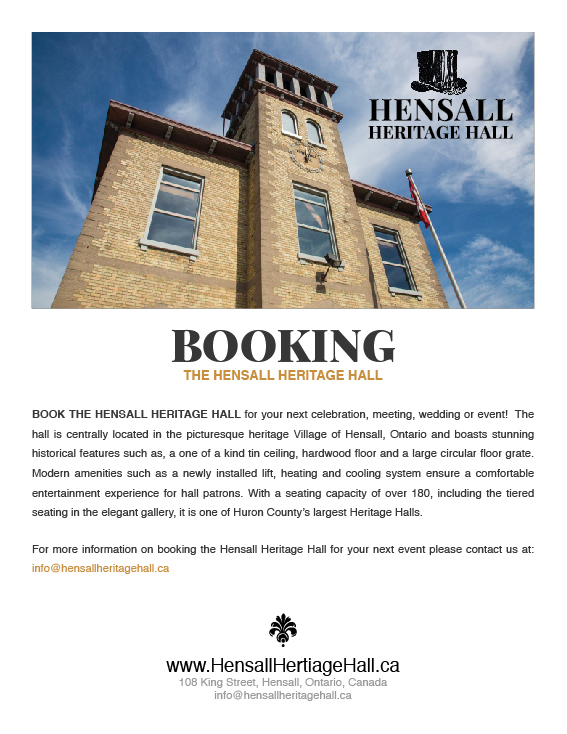 Book the Hensall Heritage Hall Today!